Testimonials - What 100's of People Have Had to Say About the Famous, Free Steven Harris Family Preparedness Class. Join US....take the class and be part of the Prepared Family. I need a refresher: Can you tell me how I can access and listen to this class again? For example, after listening the first time, I bought some D cell batteries, a TV/weather battery powered radio, low watt lights, a long outdoor electric cord, and an inverter. Also, my wife and I have dozens of filled water containers around the house such as those half gallon, plastic soft drink bottles you recommended. Unfortunately, I've forgotten the formula for how to estimate when the car battery needs to be recharged based on the wattage of accessories it is running. Wait a minute! I'm remembering something: watts = volts x amps, so if I'm running 12 total watts of applications off the system from my car battery, that's 1 Amp hour for each hour of use, correct? I think you said I'd have 15 Amp hours of use from a well-charged battery before having to start the car to recharge. Am I remembering this right? Fortunately, I haven't had to use information from your course yet, but I very much appreciate the information. I've been looking into solar ovens, too. 1. Did you listen to the class. At home? on the computer? on an Mp3 player? Ipod? Car? under your pillow at night? I listened at home and at work on my laptop. 2. Did you find any of the class information interesting, which parts. What storage? 30 second bread? Batteries and power? What happens in a disaster? It was all good, but I especially liked the easy quick bread method. I have Esther Dickey's "Passport to Survival", and I like her approach, but if the chips are really down, your method is much better. 3. Did you actually DO ANYTHING with what you learned? Started to store water in soda bottles? Made our instant bread? Bought any other food supplies or preperation materials? I bought a tortilla press, more wheat, corn, pinto beans, brown rice, and started collecting simple recipes. 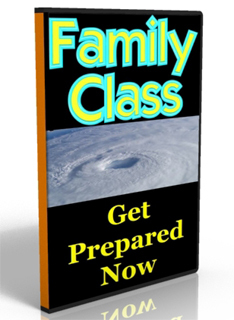 You requested the family preparedness class from us in MP3 format from www.knowledgepublications.com . Please email us some feedback or stories on the class and how it has or has not helped you. With Hurricane Season coming up, we'd love some true stories and other notes of what yourself and family learned from our class. You comments could really help others. 1. Did you listen to the class. At home? on the computer? on an Mp3 player? Ipod? Car? under your pillow at night? I listened to it at home on my laptop, and then again with my husband. 2. Did you find any of the class information interesting, which parts. What storage? 30 second bread? Batteries and power? What happens in a disaster? I found the part about using the inverters hooked to the car battery helpful. I even have two, but forgot about using them during the ice storm we had several years back. I also found that thinking outside the box with the food was very helpful. I don�t need to use flour to make bread, I can make donuts, tortillas, etc. that take a lot less time and energy. 3. Did you actually DO ANYTHING with what you learned? Started to store water in soda bottles? Made our instant bread? Bought any other food supplies or preperation materials? I have been prepping for several years, but I didn�t know I could use soda bottles for water, especially stacking them on the sides. I have passed this information onto the forums at fluwikie.com and it has been integrated into several pages of �must know� information. Many people who were using milk cartons have thrown those out and are now using the soda bottles in their preps. I don�t need them as we have a pond, well, cisterns, but I was happy to be able to pass this info on to others who aren�t as fortunate in the water arena as we are. I have continued to prep and now have a year�s worth for 7 people. I have looked at alternative energy sources both small and large and implemented quite a few. 4. What part of the country / world are you in and what is the threat / concern that you want to be prepared for? Terrorism? Nuclear? Hurricane? Tornado? Blizzard? Blackout? EarthQuake? Sale at Wal-Mart? etc..
All of the above! We don�t know what�s around the bend. I probably don�t need to worry about a hurricane direct hit, but one or two could severely knock out oil production, shipping, food supplies, you name it. However, my main concern now is the potential of Bird Flu to turn pandemic. At home a long time ago. It was good. Storage was helpful, shower curtain for hole in roof etc, And overall it made me think about getting guns to help protect my large family. I taught my wife what I learned and plan to emplement when I get settled in my own home. I am pretty much in a vary safe place. Nestled in NC mountains. We have had some tremors. I want to be completly self reliant. 5. Did you suggest to anyone else that they listen to the class? Friends? Family? Neighbor? The Dog? I told my brother and my mom about the book (your little solar book). I did by some books and DVD's. I started to collect some of the things in the book for solar projects. Aslo i have started looking for some insulated glass to make solar distilled water since we have a huge pond to draw from. I think i will make some to see it work and then put it away until I need it in the future. I bought your book Sun Shine to dollars and learned quite abit there as well too. But I have had a hard time finding any solar pannels since in my area it seems that nobody has had very much of a problem in thier road signs getting damaged. Hey Steve, I had a thought on a cheap air conditioner useing an idea you touched on in your book. It is useing the heater core you discussed about running water through it and in turn watering your lawn. I haven't tried it yet but I think it will work but I just don't know how well it will work. As you said you would have a huge water bill ,but if you take two plastic 55 gallon drums with large lids, insullate them and plumb them together with PVC pipeing. Then add a washing machine pump in the lines to circulate water from one drum to the other while running the water thuough the heater core. It seems this way there would be no water waste. Then if you fill the drums maybe 3/4 full with water and then add a solid chunk of ice(Say in a 5gal pail) in each one I think they will stay cool for a while if they are insullated and in the shade. All I will need to do is make a wooden or plastic box to fit in my window and place the heater core in it at the open end and use a squirrl cage fan at the other end to force air thuough it. I believe that it will be good enough to cool my bedroom at night. And with the cheap way you showed me to make ice it should be pretty easy to change the pails of ice out without costing me much. Any way When I get it going I will write you and let you know how it works. If you have any sugestions on how to make it better or colder for longer please write me and let me know what you think. Thanks a lot for what you have shown me. > 1. Did you listen to the class. At home? on the computer? I listened to it at home on the computer. > which parts. What storage? 30 second bread? Batteries> and power? What happens in a disaster? themselves, in comparison to duracell AAs. settling tank, and pressure tank. > 3. Did you actually DO ANYTHING with what you learned? > is the threat / concern that you want to be prepared for? > Terrorism? Nuclear? Hurricane? Tornado? Blizzard? > Blackout? EarthQuake? Sale at Wal-Mart? etc..
> class? Friends? Family? Neighbor? The Dog? I download and listen to the Family Preparedness Class MP3 files from www.knowledgepublications.com. I found the recordings to be thought provoking and informative. I was surprised at the number of relatively simple and creative things that can be done to prepare for and live through a disaster. Many of the �tips� covered could almost be considered �common sense,� but they never occurred to me. I have discussed some of the tips with my family and I am in the process of incorporating the suggestions into our family preparedness plans. It�s going to be a slow and steady process. I�m no �survivalist,� but I know it�s good to be prepared. A moderate amount of snow here in Southwest Pennsylvania can increase the time it takes me to get home from the office from one hour to four hours (a distance of 30 miles). After listening to your classes, it occurred to me that it could take days to cover the same distance if we have an earthquake that takes out a few of the bridges I have to cross or go under to get home. I may have to hike the distance and there are one or two major rivers I would have to cross. I am involved with Amateur Radio. One of Amateur Radio�s charters is that its members should train and volunteer their time and equipment to facilitate emergency communications during disasters. During many disasters, �Ham Radio� is the only reliable form of communication. I am also a Volunteer Examiner and administer Amateur Radio licensing exams. I am putting together a CD containing useful information that I will provide free to newly licensed Hams at our test sessions. I may also provide the files to local Amateur Radio clubs and encourage them to distribute copies of the files on CD. Would you allow me to include copies of the Family Preparedness Class MP3 files on the CD? I can also include a copy of your home page or a link to your site with the files. Please let me know if I can do this. Thanks for taking the time to educate people in preparedness and for making your material available free of charge. Listening to your Family Preparedness recordings is a worthwhile investment of time. I listened on the puter. I found the info very helpfull, particularly the food and water storage parts. We made the tortillas a couple times and enjoy them. I'll be doing some other experiments from the class and your blackout book. We bought and use the LED night lites and keep a supply of batteries on hand. Lets just say that I'll never concider buying a generator when I have two parked in the driveway. I have started a supply of H2O in 2 ltr bottles and need to make room for more, I also have a 55 gal drum for water which will be filled as soon as the storage area is prepped.. Although I haven't laid in a store of food stuffs yet I do have the containers to do so and plan to start that process this summer. Again, need the room. I'll be clearing a bunch of junk (some good junk) from under the basement stairs for that. I've also built a solar oven and used it a few times last summer and will use it more this year. I live in the Bangor, Maine area and my main concern is power outages. You may recall the "Ice Storm of 98" when much of New England was out of power for days, some areas for weeks. Your Blackout of '03 book dovetails nicely with and reinforces the message in the class. (especially sans utilities), and possibly terrorism. essential luxuries (one still has to live). twelve hour outage at minus 20 celcius. I also purchased your Solar publications book a few years ago. Good stuff. and the will to carry on in the face of adversity. Hi Steven; I listened to your preparedness audio on my computer at school. I'm a middle school shop teacher and try to teach my students to think about problems in the world and how they will affect their own families and what they can do to turn the problem into a solution. I'm also one of the founders of a sustainable community called "Woodhenge". We live off grid with photovoltaics and wind power; grow a lot of our own food; build our homes out of loan free materials and a lot of other things you've talked about in the audio. i also free lance lecture on the upcoming enengy crisis (we're not running out of oil, just running out of cheap oil), building with alternative techniques, alternative energy, building your own wind turbines from mostly locally available materials, preserving what you grow (canning, fermenting, root cellars, ice houses, water supplies, etc..). I found your class very enlightening. Although we do not live in a flood zone, there was a tornado that hit just five miles away from us a few years back. Thanks to you, we are now more prepared to deal with being cut off from civilization than we were before. I even bought one of your books. I also sent your information on free radio shorts to Larry Sauder at WPEL in Montrose PA. Don't know if they've used them yet of not, but I'm sure that they eventually will. You are doing good works. Keep it up. the file and I have been wanting to take notes from it. Thanks so much. Yes, I listened to the mp3 class (as well as other stuff on your site) and use the info constantly. Here are some of the things that I have observed, noticed, implemented, and teach (I also do a mini preparedness class). We now store water in the 2 liter bottles. We also have kits consisting of flattened boxes (new) with garbage bags set aside for mass water storage. When, and if, the need arises, we simply will expand the boxes, place the bags in them, and fill. They take very little space when flattened. We like the fluorescent light idea. Trouble is, with the cost of electricity skyrocketing, my wife is using them to replace regular bulbs in the house. We have improved on the 2 d-cell flashlight by using the new d-cell LED flashlight that will give off light FOREVER on 2 batteries. I did write to Duracell to find out the exact figures on battery life and got a rubber stamp answer or 1-2% a year and don't use after the 7 year expiration date (from a girl named Amy). I wrote back asking for more technical info (logarithmic or linear shelf decay, etc.) and heard no more from the company. Oh, well. I love your pictures that you use in your talk and would like to get some to use in mine. Where did you get yours? We use self rising flour instead of plain in the fry bread. I also suggest corn meal 'pones' to add fiber. And if you are doing a lot of manual labor I suggest adding calcium to the diet. Seems like the muscles will fire lacking anything EXCEPT calcium. Green, leafy veggies, dry milk, oyster shells, etc. will work (even calcium pills). I broke a tooth using field corn when making the corn nuts. I add that disclaimer now to my talks. You are very interesting to listen to, and your down-to-earth, workable advice makes a person feel they can actually DO something to survive. We are storing water in bottles, though not enough. I have built but not finished a small portable solar oven. I ordered and gave away some of those solar-focusing flexible pieces. If I owned my own place, I'd do more. I have plastic bags so I can fill drawers etc with water if I get the chance. Also I looked up and read about water survival...finding water in the desert, for example and that was wonderful, and I did that because of your class here. Just a few of the things I've done. I also tried to get you on Coast To Coast Am radio show, and have told lots and lots of people to go and look at your page. Yes, indeed I did listen to the entire Family Preparedness Lecture and very intently I might add. I listened while lying on my sofa recovering from emergency eye surgery for malignant glaucoma. I am disabled and have severely limited funds. I am also a single 60ish female and want to be as prepared as possible on limited means. I was one of those Y2K folks that kept telling everyone that we weren't just preparing for Y2K but all kinds of man-made and natural disasters. I lived through Katrina last year on the Mississippi Gulf Coast and have a new found appreciation for all kinds of pretty basic things like toilets, bug spray, cooking on a propane stove, purifying water, etc. 1. your information on rechargeable batteries--you saved me a lot of money--I was just getting ready to buy all that stuff. Now I will go with Duracell D Batteries. 2. 30 second bread. I live in San Antonio now and cannot believe I had not thought of this myself. I have already made 30 second bread and made puffy tacos and sprinkled with powdered sugar and cinnamon. Yum! Also, made funnel cakes in the skillet. Also, yum! 4. I decided to research "how to survive the heat in south Texas" in a rolling or total black out. One thing I've done is begin to recondition my body to adapt to higher temps even with AC. I have done this gradually, beginning at 78 an taking the thermostat all the way up as high as it will go, or just turning it off. While I am not a happy camper, I can do it. I wet cloths and put them on my neck and top of my head and keep resaturating them. I dangle my feet and legs in the bathtub of water. I drink lots more water. And, I'm going to buy a kiddy pool and fill it. I also picked up a cheap orange construction worker vest (you know the kind they were on the highway) and made velcro pockets to put rolled, wet bandanas into to help with evoprative cooling. 5. I now have a 1200 watt inverter (from Pep Boys, on sale for $100) and have a trickle charger and battery cables. I plan on getting a deep cycle marine battery when I can afford it. For now, I could use the battery in my SUV. 6. My brother who is still living in a FEMA camper on our once horsefarm in Mississippi, has listened to all of your material and has purchased some of your books. 7. While I am a fair shot with my shotgun, I don't believe it will be much good up against AK47's or other weapons. So, riots are my biggest concern. I don't have anywhere else to go--so will have to hunker down where I am and keep a positive attitude. After surviving Katrina, relocation to San Antonio and seeing my family scattered to the four winds, a heart attack in October, a diagnosis of full blown diabetes in February and malignant glaucome on April 28th, My new philosophy is: if it ain't bleeding, or dying---it ain't too bad. Thanks for sharing this priceless info with us, Steven. I've looked at a ton of sites that go the traditional (read expensive) route and the let's panic and hide everything from our neighbors and friends. That's just not where I wanna go. Practical and common sense and sharing will get us through whatever comes next--anything else is just paranoia and chaos. In one of your classes you commented it is better to have lots of food available for crisis times, its easier to feed your neighbors than to fight with em. I listened (an downloaded for another shot at it on my m3 player) and was thinking how dumb I was for not thinking if the simple things you talk about on there. Sitting there going "DUH!" the whole time. . . I am not a survivalist, but am very interested in surviving by preparedness. I am working on an off-grid lace where we can survive if the whole thing collapses in the future. Your info is noted and will taken into account for my preparedness. Thank you for asking about any comments from us. I enjoyed listening to your audio class, and I also purchased your Sunshine to Dollars book and Blackout of 2003 book. I live in Florida so we face our share of hurricanes. Since I began reading your publications, I have started saving water in soda bottles, set up a "hurricane goods" shelf in my pantry, and purchased an inverter to plug into my car lighter. I also started purchasing low-wattage CF bulbs to gradually replace the incandescent bulbs in my home. Two years ago we had 4 hurricanes in rapid succession. Our power was out for about a week so we had no A/C, no ice and no running water. Stores nearby had no ice. It was hot & humid and we were sweltering. Our dogs were laying on the A/C vents but nothing came out. It made us even more miserable just watching them. In your book Sunshine to Dollars you used refrigerator components to make ice and A/C. I can see how I might be able to make ice, but is there a way I could use the ice-making setup to cool a room in my home? Even better, could I do both at the same time? I wouldn't be able to use the method on pages 31 & 32 of your book since I wouldn't have running water. Could you explain this as simply as possible for a 47-year old woman with little experience in that sort of thing? Sort of a 1-2-3 steps? It would be so helpful! One more question--where can I find the adaptor you mentioned for the inverter that has a cigarette lighter socket on one end and alligator clamps on the other end? Thanks very much for your kind support and very helpful information. Thanks for the reminder. I have become lax to say the least and I need to get back to collecting the necessities. We did store some water, can food, D-cell batteries etc, but we need to go back over the list and make sure we collect the other things we haven't done yet. For example, I need to obtain a heat source other than blankets. I listented to it on the computer during the day, and my wife did the same. <2. Did you find any of the class information interesting, which parts. Yes, batteries @ room temp; improvising water storage in plastic bags; nutrition isn't important in survival until the desaster is over. <<4. What part of the country / world are you in and what is the threat / concern that you want to be prepared for? Terrorism? Nuclear? Hurricane? Tornado? Blizzard? Blackout? EarthQuake? Sale at Wal-Mart? etc..>>In Tennesse the concerns in order would be power outage from ice storms, tornado, terrorism, earthquake, nuclear, blizzard, etcetera. Yes, but they thought it was preparation for the end of the world instead of practical emergencies. The biggest impact the class has had to date has been in helping us lower our food budget rather dramatically. It really opened our eyes to how much money was being wasted just to hire people to measure out ingredients for us. Now if Olnly I hhad a time machine to go back and recoup all of the money spent previously. No crises to live through and put to actual test, however some preparations have been made with more plans for future. We have started collecting and storing water in soda bottles. And laid in a months worth of food stores for right now. More planned for future as income allows. tentative plans made to construct a pantry type fallout shelter as mentioned. I have read the survivng Nuclear war pamphlet you prefaced in your article. At this point my concerns are more torward limited nuclear fallout from terrorist attacks than full exchange. We have also made plans to get additional water from a natural spring on property next door to us in event of prolonged crises that exceeds our water storage capacity. Water has been tested and passed. biggest concerns for us here in Maine about 30 miles inland are food supplies to withstand a week or two disruption dure to natuiral disasters such as the Ice Storm we experienced in 98. We have a generator for that one and a supply of 50 gallons of Gasoline replenished each year and stabilized. Stored in outside shed with multiple 6 gallon gas cans. Biggest concern would be some sort of nuclear or bio attack that would shut down society for longer periods of time. I ssupect any scuh attack would be limited in nature and a 2-3 month supply would be adequate. Since food stores are cheap enough , I am planning on eventually building up to a years suplly of staples that can provide subsistience sustenance. The when all is said and done, still we rely on the hand of the Lord to make the ultimate decision of what fate we experience. Yea though he slay me, yet will I trust him. Steve this is in response to the MP3 disaster class. biscets. I will do that this week after finding sealed containers. 4.
it to cook biscets. 5. I was amased about the data on battery size. stored nails and tools around home to form shelter. I work in Washington, DC and was involved with continuity of operations (COOP) and continuity of government (COG) planning prior to my retirement from the US Secret Service in 2004. I became motivated toward practical emergency preparedness planning for my family. During subsequent research I discovered your web site and MP3 class. I listened to your class on my dell mp3 player while in the car on my way to work. I found the class to be excellent. It is what I refer to as disaster "urban expedient survival" as opposed to "lost in the wilderness - what plants should I eat - survival". It contained very practical �take home� information which could likely save your life. In the days before Katrina I noted the salient points of your class and provided them via email to friends, family and coworkers (throughout the country), with a link to your web site. I got such a positive response from coworkers that I contacted you to discuss your teaching a customized class. Unfortunately, we were not able to schedule the training. I have since moved on from that position and am now working for DHS/TSA in Arlington, VA. I have recently provided information about your class to our office emergency preparedness coordinator with my endorsement. I included my recommendation that emergency preparedness training, the nature of which you provide, should be considered for TSA personnel agency wide. � Purchased a good power inverter to include in my family emergency preparedness kit. � Have cell phone charger cords in both vehicles. I'm also in the market for a portable HAM transceiver for disaster communications; although I know little about them or what would be best (bands, etc). Any recommendations? Storage, batteries and power, sharing with neighbors, etc. Yes, I have stored lots of water in soda bottles, have at least 2 weeks supply of food and supplies, and a couple of barrels of rice and beans. We live in Kentucky. Probably our greatest threat is terrorism or nuclear. A few years ago we had an ice storm that knocked out power for 2 weeks in some part of the city, but ours stayed on. Friends and family. My sisters have listened to me. I don't think anyone else has. Thank you for the class! I enjoyed it! Hey Stephen, this is really great information. I have made CDs for all of my family, and everybody else who will listen. My husband has always thought that it was "just ME!' overreacting to today's current events, and prophecy. I consider myself to be reasonably paranoid. It would seem to me that anybody who isn't "paranoid" is either ignorant, or radically irresponsible therefore incapable of taking care of themselves in any emergency. "They" really are out to get us....they said so. My method of operation here is simply to keep dripping little bits of info into my family's consciousness every day. Now, we do little bits of emergency preparation regularly. Your CD has helped quite a bit. He can listen, just like others have said, in his truck on the way to work, uninterrupted. When we were kids, our parents and grandparents canned, gardened, and stocked up every chance they had. Now, we are teaching our kids the same thing. (I am 54yo) My grandmother left us her diary of 1936-1940. During this time period, she had several children, two of them starved to death. During her child bearing years, she had 13 children, and lost 2 during the depression. Many others in our family suffered great trials, and many of them didn't make it. I believe it could happen again. Whatever comes up, I feel a tremendous responsibility to prepare our kids for it. We have 5 grown kids, all married with kids. There are 14 grandkids now. I want them to have every chance to survive and do well in spite of anything that will come up. Thank you so much for caring enough to make this information available. 1. Yes, I listened to the class. 2. Yes, I found the class interesting, all of it. 3. No, I haven't done any actions relating to the class. 4. I am from Yuma, AZ. there are several military bases here. I have had a dream that related to the destruction of one or more of those bases. This affected the whole city adversly. On another note the regular day time temperature in the summer is 105-115'F. I work outside (swimming pool maintenence), I drink from 1 gallon to 2 gallons of water per day if I am outside at all. we also get the effects of earthquakes from CA. 5. Yes, I did share and suggest to two others that they listen to the class. I have looked on the internet to find the CERT local info. Our tap water has high TDS, 700-900ppm. I am not exactly sure what effects that has on the body. I do know that TDS levels are on the EPA's secondary list. I do know that Glacier water company keeps their TDS levels below 20ppm. 6. Yes, when I have done some things or have had some experiences, I will write to you about them. NOTE: How would you like your Idideron truck to be able to get 50+ mpg? The class is a self empowerment tool. While I am not the most knowledgeable person on preparedness, I live my life in such away that people who know me see the need to become more prepared. My inventory consist of solar panels, solar over, marine water still, 12v inverters of 3000w, 500w, 2 x 100w, books and knowledge of eatable plants, some dried food and H20. The section on storing water in soda bottles and making instant bread was something I have never thought of and will be a part of my ongoing schooling on the subject of family preparedness. This is not very expensive to have as part of my supplies. There always is the question as to what to put in your short and long term survival supplies, you covered that part very well. I live in Las Vegas Nevada and have been a fireman for 16 years. In 4 years I will be moving to mountain of N. Calif snow country. Hope to here form you and you team, I am always looking to learning more on the subject you teach. pop bottles for water storage. to run them over with a bus. I saw this done. It will break them. I have not tried the bread as of yet but I am going to do that. I have told a couple of people about the class and the web site. Thank you for sharing your knowledge and wisdom. I was writing to let you know that I had downloaded a copy of your family class and found the info very useful. I had been storing food and water before I listened to your MP3 but the info you provided on storage of things like sugar, flour, oil, etc. was VERY valuable. I have used the info to make the flat bread, came out pretty well. I haven't tried the doughnuts or anything else yet. It makes long-term prep work a lot less expensive, always an important consideration when on a limited budget. Thank you for making this information available to all. If you can, please put more info in MP3 format on your website. It is very valuable and makes it easy to listen to when cruising around at night with not much going on (I am one of the heathen Police Officers you refered to!). the conference was input from the Medical and Health. Help for Katrina except it was for an expected Earthquake The Madrid Fault along the Mississippi. pasteurizing urine to drink. I am presently getting me some glass from Binswanger. Doors I can get from my local Lumber Yard. Question - Can a stainless steel oven liner from a Microwave be use for solar cooking? Just a thought. I am wearing out the pages on Sunshine To Dollars. I have also downloaded Hydrogen Car & Multi Fuel. I am having a great time doing just that. Thank You. I have begun preparedness storage, a little at a time for now, water and food. I will ramp up storage as time and money permits. We live in Eagle, Colorado in the middle of the state so we are somewhat more isolated than the general population. In general I would like to be prepared as much as possible for an extended emergency, one that would be long enough to prohibit any help from traditional civilized means from getting to us, hopefully not to long but who knows. One particular threat to our family caught my attention while listening to a podcast of a UC Berkley class IAS 180 US foreign policy after 9/11, class lectured by Harold Smith about nuclear weapons and terrorism. Just using Smith's lecture as one example, his contention, as well as those in his field, is that there will be a 50% chance of a nuclear detonation in a major city within the next 10 years. If so the world would basically shut down, ports, airports, travel, world trade, etc... for an undetermined amount of time, especially considering the US does not have a basic plan of dealing with that prospect. And considering the dismal reaction to Katrina in New Orleans, I do not believe being caught unaware is for my family. I am not exactly waiting for the end but from what I read and hear, and I do go out of my way to pay attention, I think there is a fair chance of being in a position of testing our self reliance. Through your lectures it sounds like I can be prepared for an fair amount of time if we need to be self sufficient, all for a little amount of time and money. Thank you for your lectures and I look forward to new ones. 5. No . my freinds think i am nuts for doing this . My wife and I enjoyed the class very much. I listened to it on my computer at home and taped the class on a cassette player from my speakers, (Older Computer) so it was hard to make out some things you were talking about. My wife then heard it with me in the morning on the way to work. What information we did make out, we didn't take to lightly, because we know how important it is to be prepared and having to depend on yourself in times of a crisis. For instance, when we had the East Coast power outage not to long ago. My wife and I were on our way home from work, the triffic lights didn't work, the telephones didn't work and people started to get frantic. There was no gasoline hardly by the next day and if there was, you had to wait in very long lines and hoped you didn't run out of gas while waiting. Also you hoped there was gas when you got to the pump. I had a generator to be prepared for just a situation like this, but guess what, it didn't start, but I could hear my neighbor running his. I also remember the temperature being very hot at that time. So, my wife and daughters and I, experienced first hand of having a generator and some gas to run it, but also not working. To back this up, I had small cans of propane and a small two burner camping stove I got a while back, at one of your local stores. We now had something to cook with. This was a secondary backup plan for my first backup plan. I remember in your preparedness class, you taking about people buying expensive generators and walking back from the gas station with 5 gallons of gas to run them. Just goes to show, it's good to have another backup. We did go to Costco and purchase items in case of another incident, such as Flour, Sugar, Cooking Oil, Powdered Milk, Jelly and other stuff (made instant bread with jelly on them, taste great!) and bought other items such as, Toilet paper, 5 Gallon Buckets, a toilet seat to use with one of the 5gal buckets and 16gal tote bins. Some of these bins I sealed with caulk (underside of the lids outer ridge along with the pin holes I found in the handles), to make sure it was air tight for food storage. Kept in the cool basement. I also wrapped (as tight as possible to keep the air out) the items in plastic garbage bags. Water: 1 & 5 gallon bottles, (when on sale) cases of 24pk, 16oz to 20oz bottles. I have several 2 liter pop bottles that are empty at this time. I would like to get your opinion about cleaning them, to get rid of any bacteria that might be in them. Since I don't have any city water, that has all the chemicals in it already (because I have a well), should I just boil the water and fill the bottles after I clean them or put in the Iodine treatment you mentioned after I clean them? Also, what needs to be done to make sure the refill water you get from the supermarkets filtered / osmosis water machine will be good for storage when you get your bottles (maybe take home the 1 gallon jugs and fill the pop bottles) filled? Magnifying Sheets (to start your fires) that you have on your web site. They work great! Have one in each vehicle and a couple in the house. Sleeping bags, Blankets, warm / cool clothing. A couple of nights we watched TV, had a light on and a fan running. I have a deep cycle battery for my 12V electric boat motor. I try to always keep it charged just in case, because you never know! I have an inverter to hook up between the battery and the house item I wanted to turn on, to change the DC battery current to AC current. I mention this because of the shower curtain incident in your class, to not only look at things you have around you for just the purpose they were intended for, but also what you can turn them into, to help you out. I'm just an average person that goes back and forth to work 5 to 7 days a week, except I just want to be prepared alittle more than being totally lost when the time comes. It's happened before and it's going to happen again. I think we can all count on that! It's just WHEN and WHERE! I live in South Lyon, Michigan, so it can get fairly hot in the summer at times and really cold in the winter. I have a coat for winter that causes me to sweat a lot, so I know that's not what I want to keep wearing. Even though it keeps me warm, for survival purposes I'd probably end up freezing or dehydrating if I was in the wilderness. My face, feet and hands get very cold in the harsh winter winds, plowing the snow on the tractor. I would like your opion and suggestions on what woulk be the proper clothing or where to shop for it. I know the material is suppose to be able to breath, but Gortex doesn't work for me. My wife and I suggested to several people about preparing for another disaster and to put food, water and whatever their going to need, away for themselves, but it's really sad that 90% of them think they can just go to the store and get what they want during these times or go over to their famalies house and get what ever they need. Personally, I wouldn't mind to much, except if there's no gas to get to my house or the road is flooded, downed trees or power lines, then I can't share anything with them. One person where my wife works in a management position said, this is America, What ever that means. I guess the gov. will resue us. I hope Katrina changed their way of thinking. Even some of my family members say they were prepared, but when I go to their house, I don't see anything stored away. I know, because I do work on there house at times. Mr. Harris, if you fill it is necessary to edit any of this, please fill free to do so. Thanks for helping out, caring and being there for people. Keep up the great work! 1,2 & 3: Yes I listened to your audio and it was by far the best, most practical advice for getting through a tough time than anything else I have read...and I've been studying this subject for a while. The day after I heard your less on "making donuts!" my wife and I tried it out in our kitchen -- and you were right, it was not only very easy but very tasty too. And then we realized that so many other things can be used in this way: bisquick, pancake mix, etc. However in the class you mentioned that if we were serious about storing food for a year or more, we should contact you regarding long term bulk storage. So....I'm contacting you! Do you have any other classes or books that teach this subject? You mentioned corn meal, etc so this I think is beyond the flour/oil/salt/water thing. Also, I bought your book on surviving the blackout -- the pictures helped me understand your 5 W light & inverter hookup much better. 4. We're in the Pacific Northwest, Oregon to be specific. 5. No, not yet. But I will, to family members who have already gone through a very tough hurrican (Charlie on the west Coast of FL in 2004) ... I think they will see the simplicity & logic in your advice! 6. Not yet, I hope we won't have to! Thank you again, and if I can learn more about longer term ( 1 year) storage from you somehow I would greatly appreciate it. I think your mp3 classes are OUTSTANDING! I thank you so much for your efforts and you sharing your knowledge to help my family and many other Americans understand the importance of being prepared in emergency situations. I see you are gifted for teaching others alternative ways of utilizing free energy to improve the conditions on our planet. I hope and pray your good hearted nature, efforts and talents will be recognized not just in America, but all over the world. I will be looking forward to knowledgepublications.com in the future to learn more and utilize your books, DVD's and information to help my family, friends and neighbors as well. I have listened to many of your audio recordings on preparedness at stevenharris.net, and I bought your book on the Blackout. You have LOT of very practical info -- by far the best of any source, and I've been researching this stuff for at least 6 years now. Dear Stephen, I was really interested in the family preparedness class and the information you provided is both life-saving and very current. I've started saving water in soda bottles, I have an inside storage area where they don't get too hot and covered with dust so I've made a set of shelves to put them on and store them. I have a gas grill and the information on using a gas grill to make instant bread with supplies you have on hand, provided you have the intelligence to have the supplies on hand I thought was very interesting. I live in a small development in Ocala Florida and we have hurricanes from time to time with power outages and the other blackout that's come with strong wind storms. So I'm taking steps to be more prepared and I wish to thank you for your class, I hope you don't mind if I keep it in my favorites and refer back to it from time to time to stay refreshed, up-to-date and prepared not only for myself but for my neighbors and friends.